For this Easter lunch we decided to visit our favorite seafood place by the sea shores. 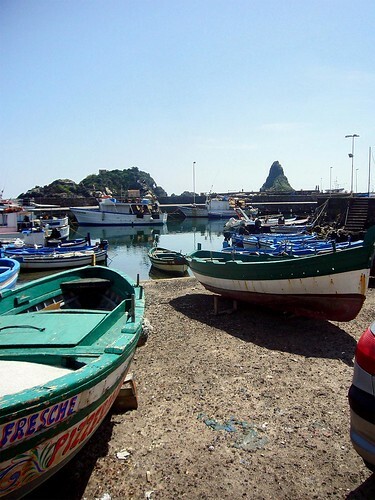 The little, family run restaurant “I Malavoglia” is located in the once fishermen village of Aci Trezza near Catania. 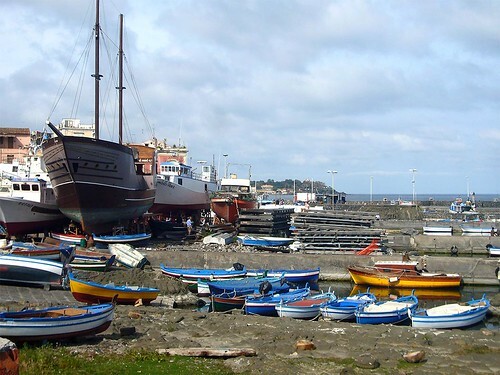 The restaurant takes its name from a novel of Giovanni Verga; a father of Italian literature who placed in this village his stories depicting the everyday struggle with poverty of a fishermen family whose only hope for survival is to rely on the holy Providence. We are on the cliffs of Mount Etna. Behind us lines of villas inhabit the inhospitable but fertile grounds, orange, lemon and loquat trees. 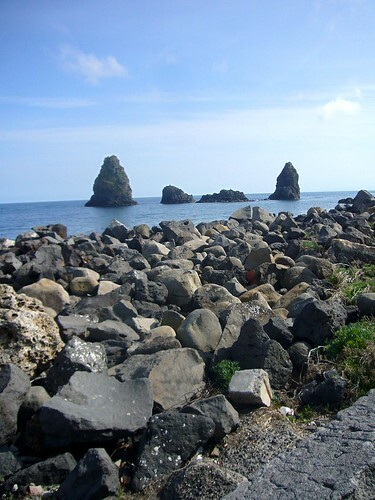 The ground consists mainly of lava stones of different nature reddish and sharp high on the cliffs and smoothed by the continuous flushing of the sea waves at the shores. The sea is dark blue and clear. The horizon is pierced by the dark jagged silhouettes of the Faraglioni; big boulders of lava stone racing for the grade of hills which, following the tradition, are the last surviving vestiges of Odysseus’ visit to the giant Polyphemus living inside the volcano. 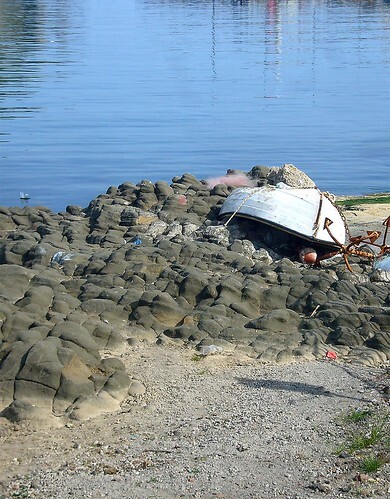 It is said in fact that the choleric giant threw Odysseus’ ship these stones after having had his unique eye blinded by a wooden pole. 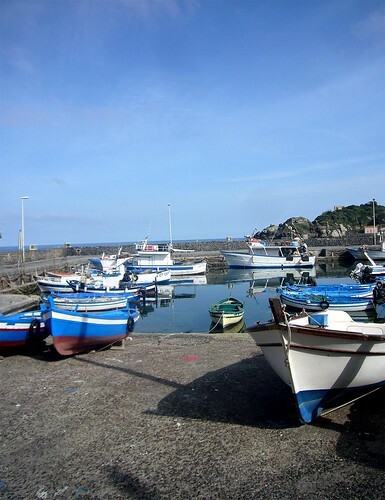 As typical of fishermen villages, Aci Trezza mainly consists of few parallel streets the main one being the “passeggiata” along the shore. 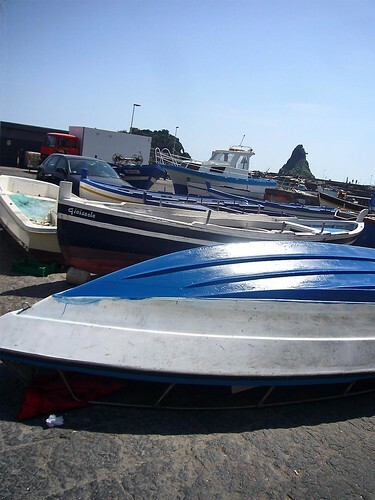 Here all the locals and visiting people, spend most of their leisure time chatting, pushing baby wagons, eating an ice-cream or digesting the just consumed seafood lunch. 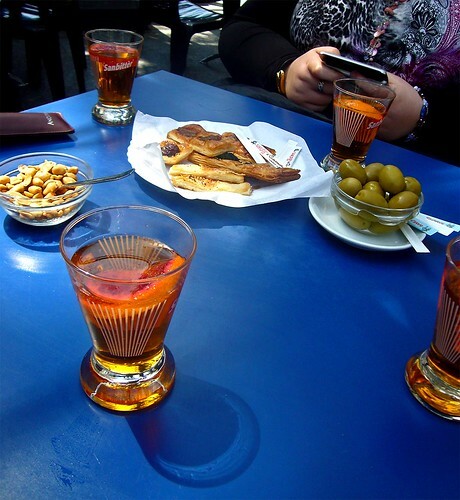 Whenever we decide to visit these sites, the usual ritual includes a stop at the main bar of the town for an aperitif. 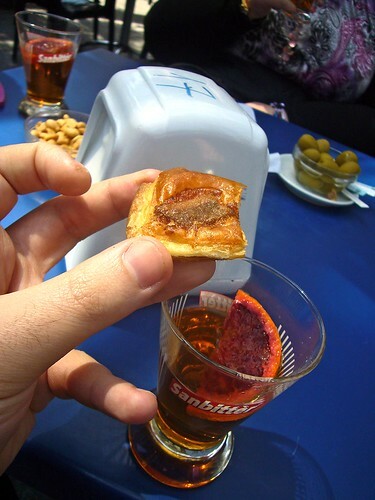 This usually consists of a bitter non-alcoholic beverage companied by a set of salty snack including olives, peanuts and small savory baked goods also called “tavola calda” (flat layer-pastry bits with a little cheese, an olive or a piece of anchovy fillet; little spongy pizzas; tiny arancini etc). The bitterish sparkling beverage stimulates perfectly the appetite and you wish you could simply have other 10 servings of tavola calda. We then move to the restaurant and start our feast. Paolino, the owner, starts by serving us a platter of freshly charcoal roasted bruschetta topped with sweet fresh diced tomatoes drizzled with spicy olive oil. We usually take then a tray of mixed antipasti “Mari e monti” (seas and mountains). 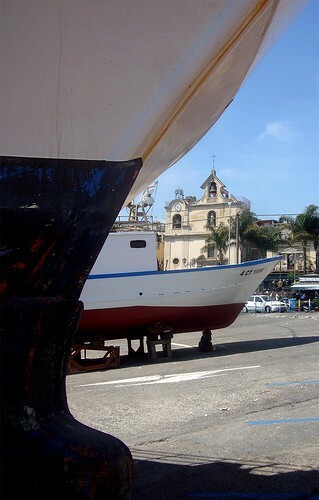 Few other towns in Sicily can exemplify this dichotomy. 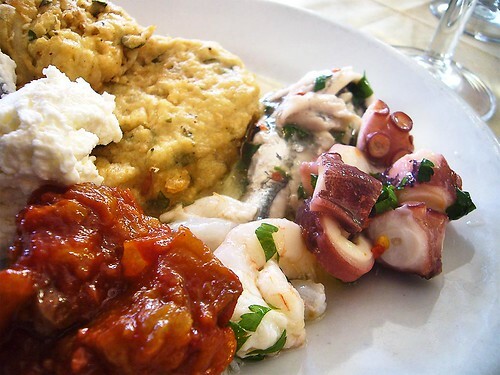 The tray consists of five little bowls containing one a spicy ceviche of shrimps, another a ceviche of fresh sardines, the other an octopus salad, a little peppers caponata and the lust a chunk of fresh, sweet sheep ricotta. A separate dish contains few little omelettes of “neonato” (newly-born fishes). 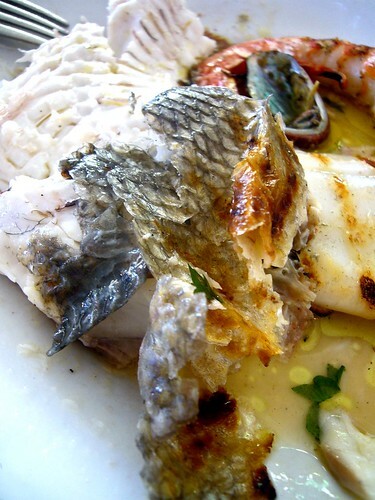 As in almost every tiny restaurant you may find in Sicily, the menu is totally oral and explained to you by the owner or the waiter. When we reach the first course, the pasta one, we rarely let them go through the whole possibilities; the “pasta alle vongole” (pasta with clams) is often our first choice. This time we chose also the pasta with sea-urchins; the poor waiter got spinning like a spin-top when he asked us how we wanted the two dishes to be divided (clams in 3, sea-urchins in 2; mom doesn’t eat fish). Both pasta dishes were great! I didn’t eat often sea-urchins in my life, I didn’t like their grittiness; we usually eat them raw out of their “tests” (that’s how their shell is called). I didn’t remember their incredible iodine flavor; a mouthful of wet beach at the sunset. The sauce was linked with the starch in some pasta water so it was creamy but clean in taste and very spicy; strangely enough the spiciness was stopping at the tip of your mouth. 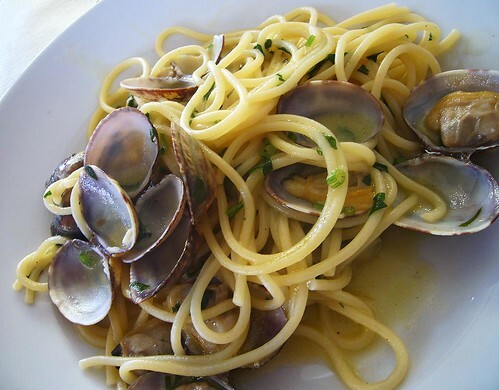 The clams’ pasta is and always will be my favorite. 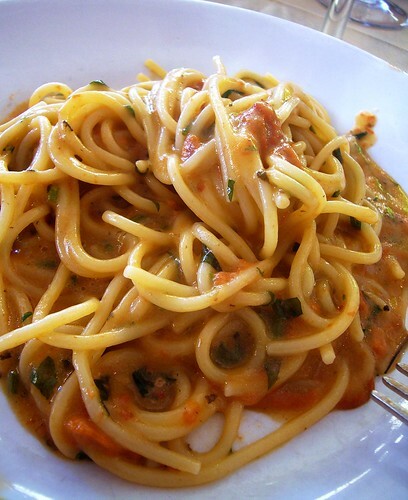 A rich mouthful of perfectly cooked spaghetti (cannot stress out enough how important the degree of cooking of the pasta is), dressed with an olive oil based emulsion sauce serving as carrier for the sweet clams aroma; the fresh bits of parsley convey the springy texture and mineral-aromatic notes that lightens up the whole. It is a real dream. 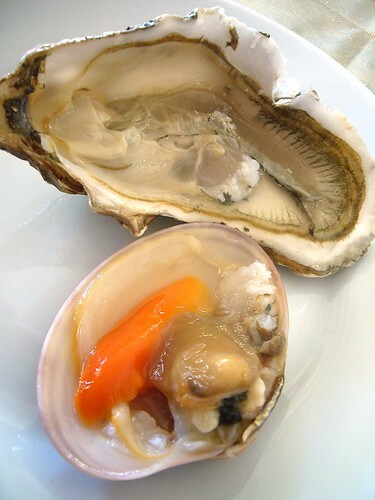 While talking of iodine aromas, I forgot to mention that after our appetizers I and dad decided to have both a fresh oyster and a scallop out of the sea water basins that flank the display of the daily catch of fish. This time I wanted to savor both of them and see what all the fuss about oyster is centered on. I had oysters in the past but wasn’t ready to properly taste and savor them. This time I squeezed a little of the local lemon on top of the mollusk, detached it properly from its shell and prepared for the experience. 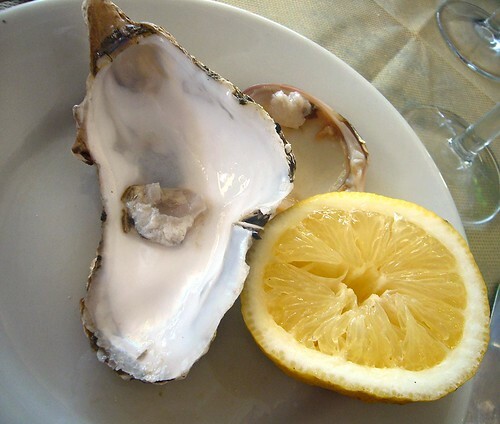 The overall sensation is that of a briny fresh and tangy sip of sea water; the oyster being very soft and not opposing much resistance to the biting. 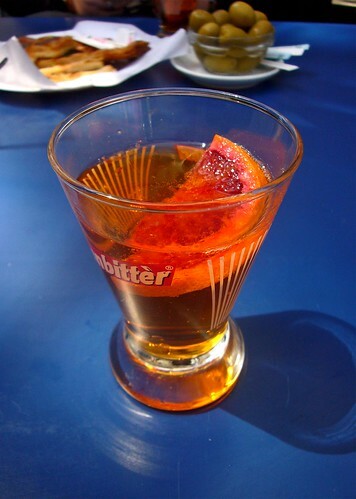 The aftertaste is a light sweetness that helps cleansing your palate. The scallop is served also in its shell, coral included. A little squeeze of lemon and there we go! 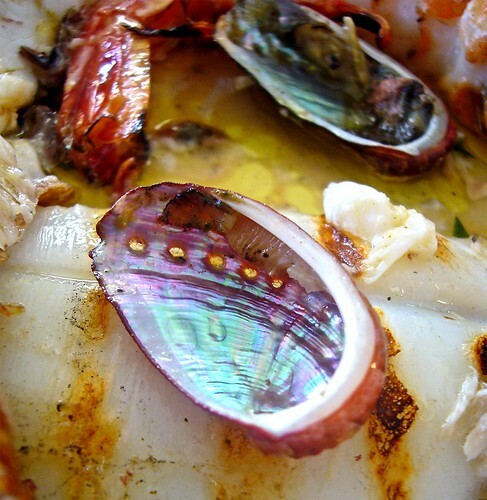 This mollusk is more resilient to the bite than the oyster. The taste is fuller with a richer sweet component reminiscent of orange zest. 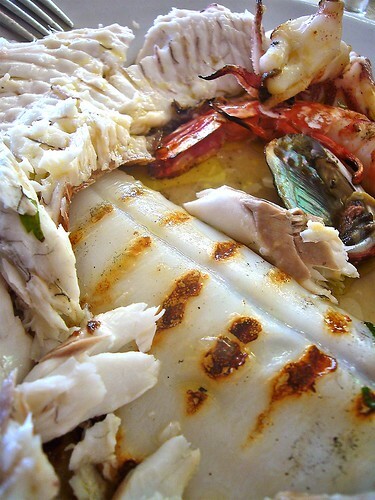 It was time for the mixed grilled fish. This usually comes from the daily catch and either you choose by yourself your fishes or the owner will do it for you. That day the catch included prawns, langoustines, calamari, gilt-head breams (spigole), sea bass (branzino) and few others specimens, exceptionally today they had also few green ormers, called locally bull’s eyes and that was what we got (except the langoustines). The fishes reach your table already cleaned, filleted and portioned; worthless to say that they were perfectly cooked, as usual. 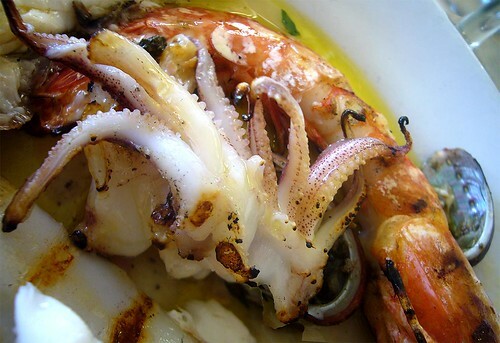 The tangy “salmoriglio” (an oil and lemon emulsion with oregano or parsley) dressed the dish perfectly providing a nice contrast against the sweet fleshes of the prawn and the calamari. 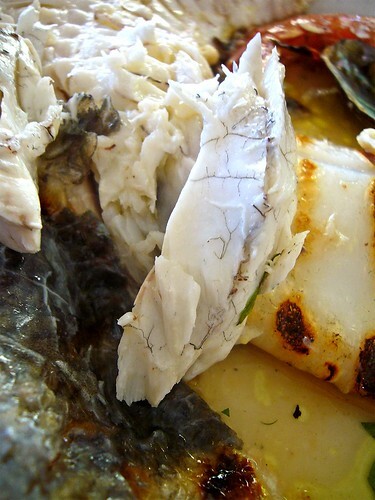 Eating fish is a lot about contrast of textures: springy like the calamari, resilient but inherently smooth as a prawn or flaky, soft and melt-in-your-mouth like the sea bass and the bream. 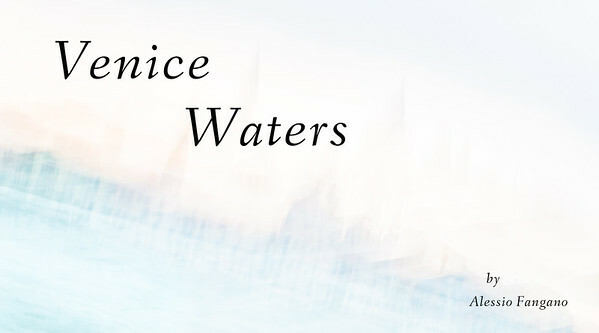 Flavors are very delicate and evanescent. Fish is a food for thoughts. 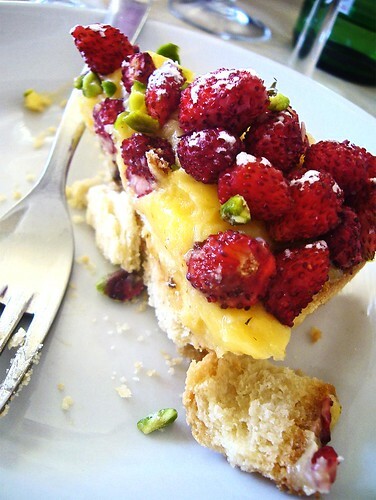 No proper festive meal can miss a slice of cassata as dessert. This time though I wanted to try also the tarte with pastry cream and woodland strawberries (that have always been particularly fashionable in Sicily) while daddy took the cassata and my sister the creamy lemon sherbet (mommy was full after her pasta with tomato sauce and steak). I wasn’t disappointed. The tarte consisted of a flaky crunchy shell of pastry dough and a rich but clean in taste pastry cream, the two buffered by a thin layer of sponge cake soaked with simple syrup and Alchermes liquor. 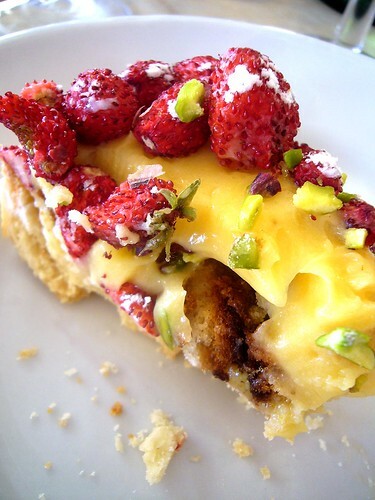 The pastry cream was then topped by a layer of tiny strawberries lightly sprinkled with powder sugar. Surprisingly enough the whole wasn’t too sweet. The strawberries are very delicate, fruity with citrusy notes; their clean acidity contrasts perfectly with the rich pastry cream. 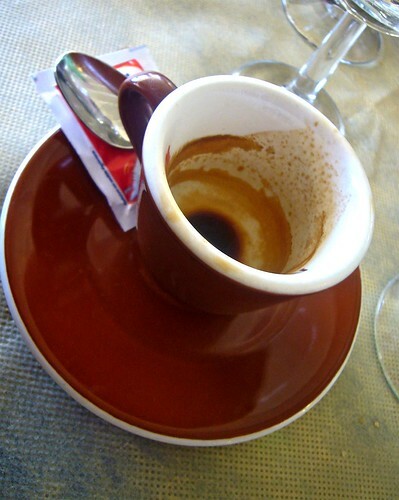 A shot of espresso and a bit of bitter liquor help the digestion. A little walk along the sea and we headed back toward home. Another Easter was gone, the sun shone for the whole day. We promised ourselves to come by again before I would leave for Germany. Alessio, now I'm not just envious of the weather but the food too. It looks amazing, especially that fish. I think I would have rolled home after all that.